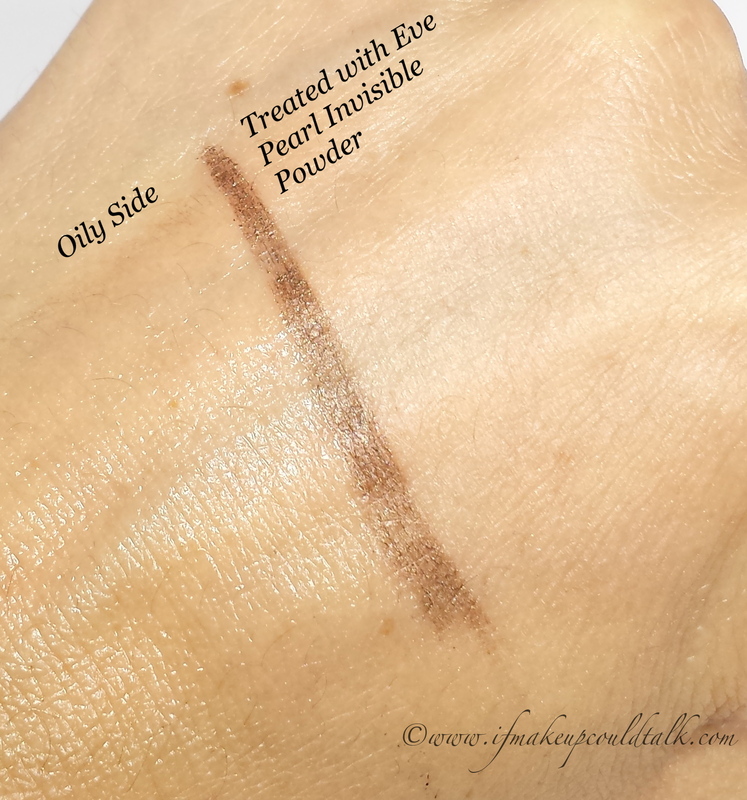 Eve Pearl Invisible Finish Powderless Powder review, photos and comparisons. As we mature, our skin seems to loose that fresh-faced finish from our teen years. Some resort to plastic surgery to restore their vitality, others succumb to the modern allure of botox. Personally, my formula for preserving a youthful appearance is rather simple–consume real food in moderation, engage in some form of exercise everyday, moisturize, utilize a derma roller weekly, and invest in quality cosmetics. 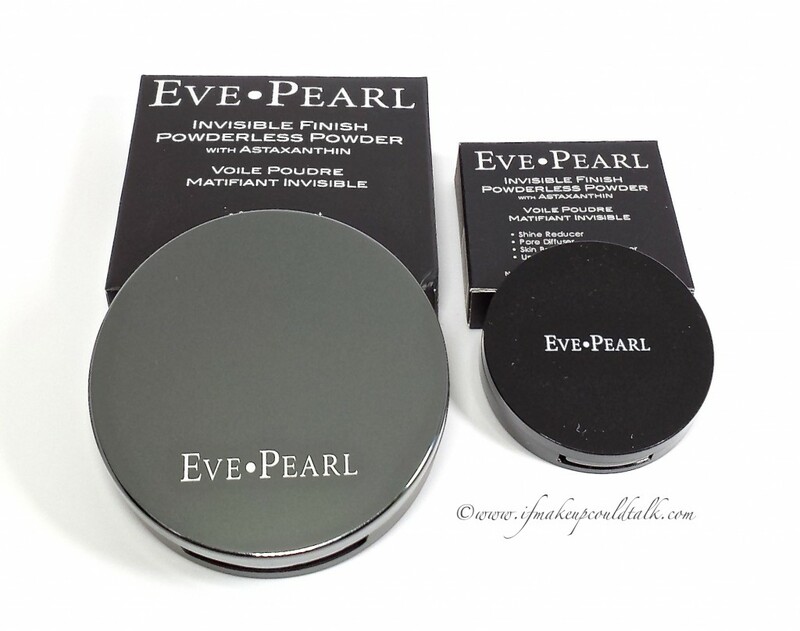 Eve Pearl Invisible Finish Powderless Powder ($52 USD/ 10g) has proven to be a wonderful noninvasive tool that reawakens my look instantly. My adoration for this product is so profound, the travel size companion ($39 USD/ 4g) was also shamelessly procured. 🙂 I hope you enjoy. Silky smooth formula (almost like a cream) glides on skin and immediately mattifies skin without looking ashy. Pores and fine lines appear more diffused. On my semi-oily t-zone, results last 6-7 hours. Contains Astaxanthin (Haematococcus Pluvialis Extract), a natural antioxidants and UV protector. Read about this amazing carotenoid (here). The solidified mass appears to have a salmon colorant (Astaxanthin), but applies clear and is appropriate for all complexions and ages. Product can be applied with a brush, the provided sponge or fingers (my preferred method). Photographs beautifully without photo flashback. Can be used on bare skin or over makeup. Sophisticated compact is lightweight with a sizable mirror and a hinged compartment to store the sponge. Vented base allows sponge to air out. Very little product is needed–compact is sure to last a while. 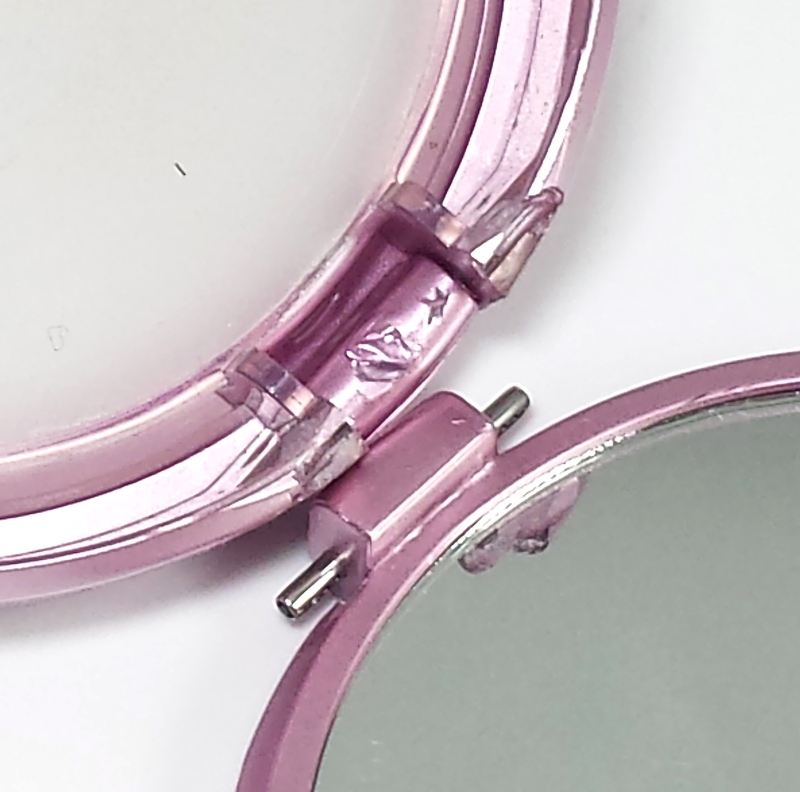 Travel size version is the size of an eyeshadow compact and can fit in the smallest of handbags. Oil free formula does not contain parabens, mineral oil, or fragrance. Slight makeup transfer if used in excess or if too much pressure is put on the sponge during application. 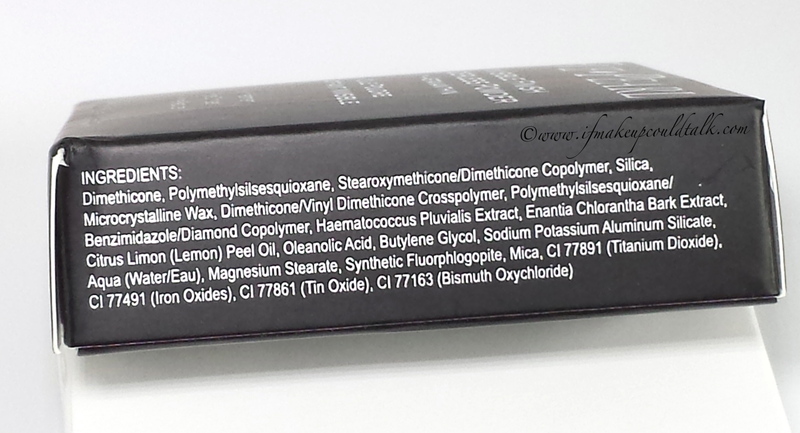 Composed mainly of silicone–not for the all natural beauty lover. Lint is easy attracted to the creamy formula–make sure your sponge, brush or fingers are clean prior to using this product. 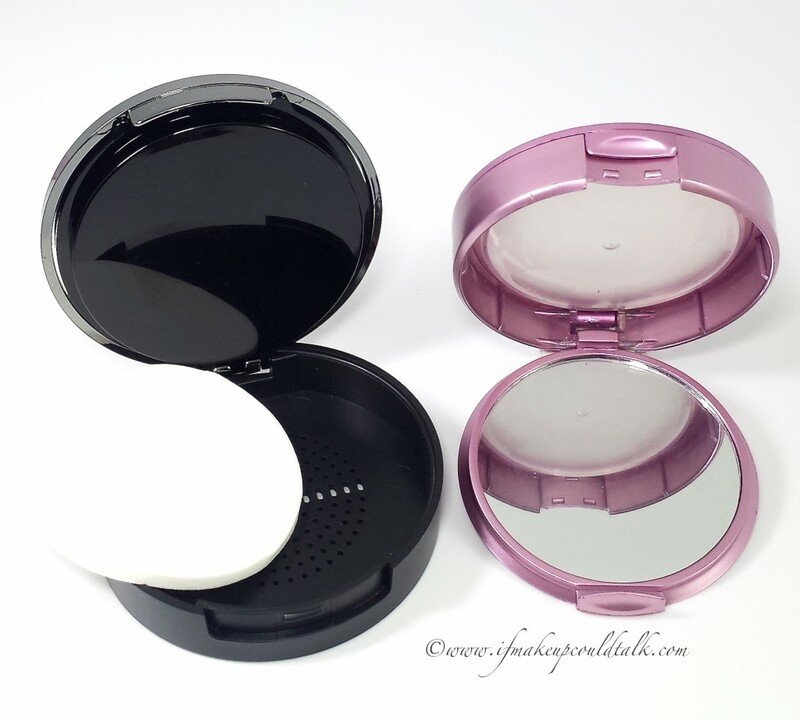 As you can tell, both products are housed in sleek compacts. The top cover of the full size version, is composed of a reflective gun-metal color with a matte black base. The travel size is plainer in appearance, with a shiny black finish. The lightweight plastic has a snap closure and is easily wiped cleaned. The full-sized version contains a sponge, but the travel size does not. This is of no consequence to me, considering I use my fingers to apply the product to my skin. The travel size version appears darker, because it is confined to a more compact casing. Thankfully, this does not effect the outcome of the product in the least. 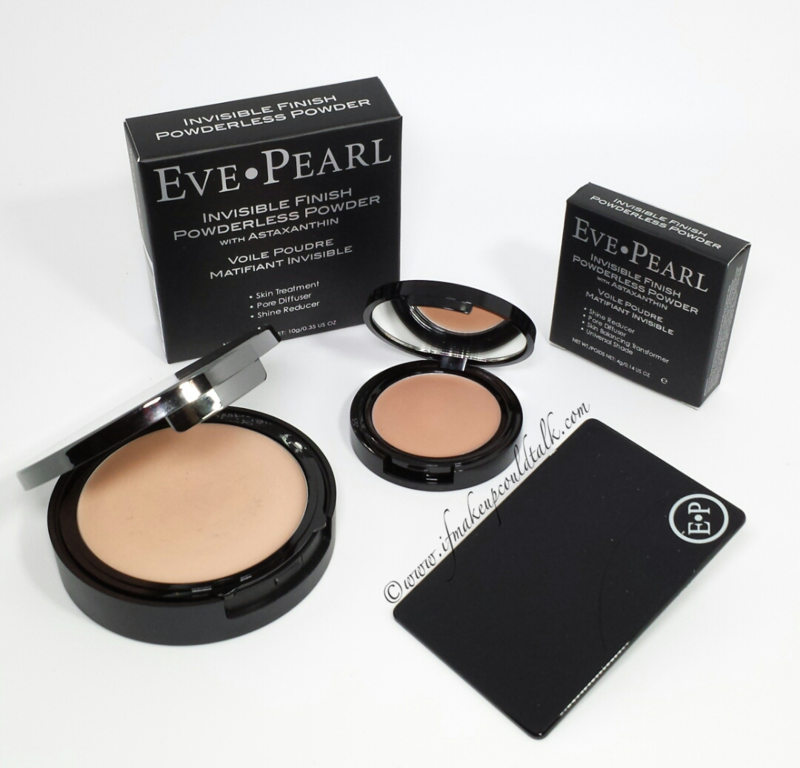 Eve Pearl Invisible Finish Powderless Powder with Wayne Goss 01 Brush. Skin covered in Coconut oil. 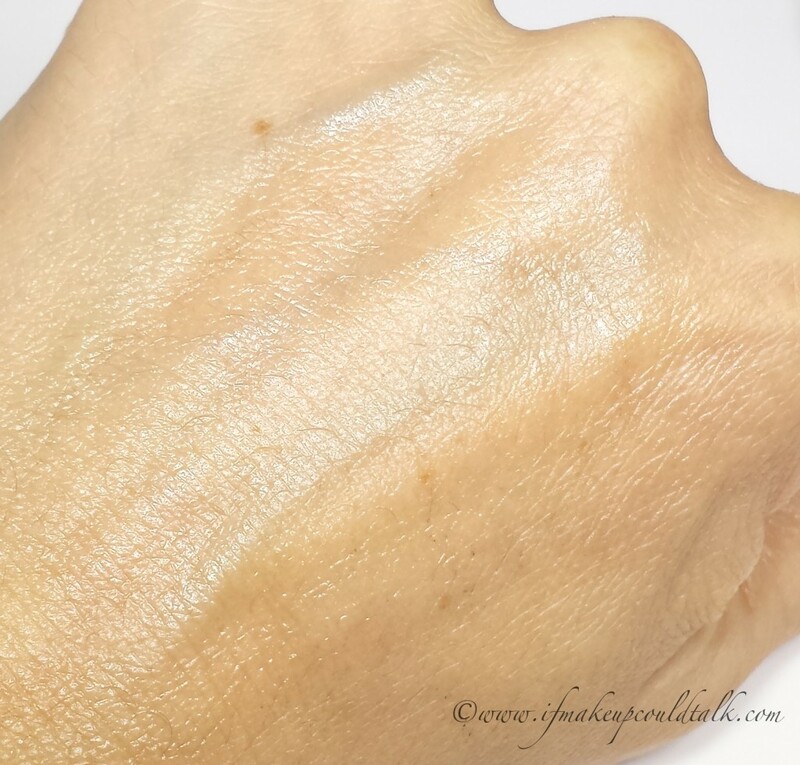 Eve Pearl Invisible Finish Powderless Powder applied to the right side of hand. 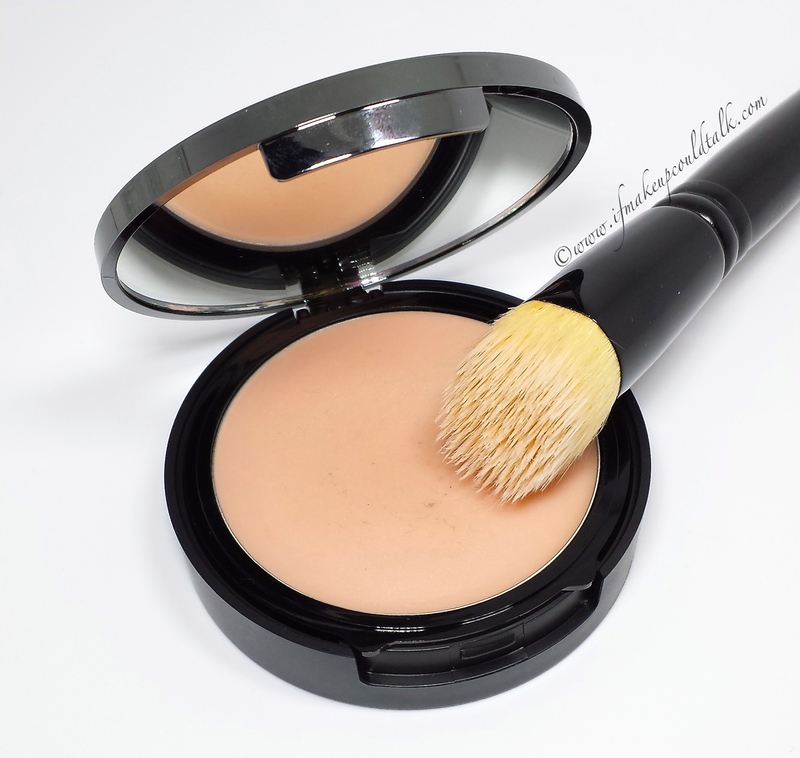 For the above photos, I coated the back my hand with coconut oil and then applied Invisible Finish Powerless Powder to one half, with my Wayne Goss 01 Brush. As you can tell, the power is completely clear and successfully mattified the skin and diffused the look of any fine lines. As expected, due to the extreme nature of my demonstration, a heavier dose of powder was used to achieve a matte finish, yet, the results were not caky or noticeable in the least. For everyday wear, a small amount is needed to achieve desirable results. 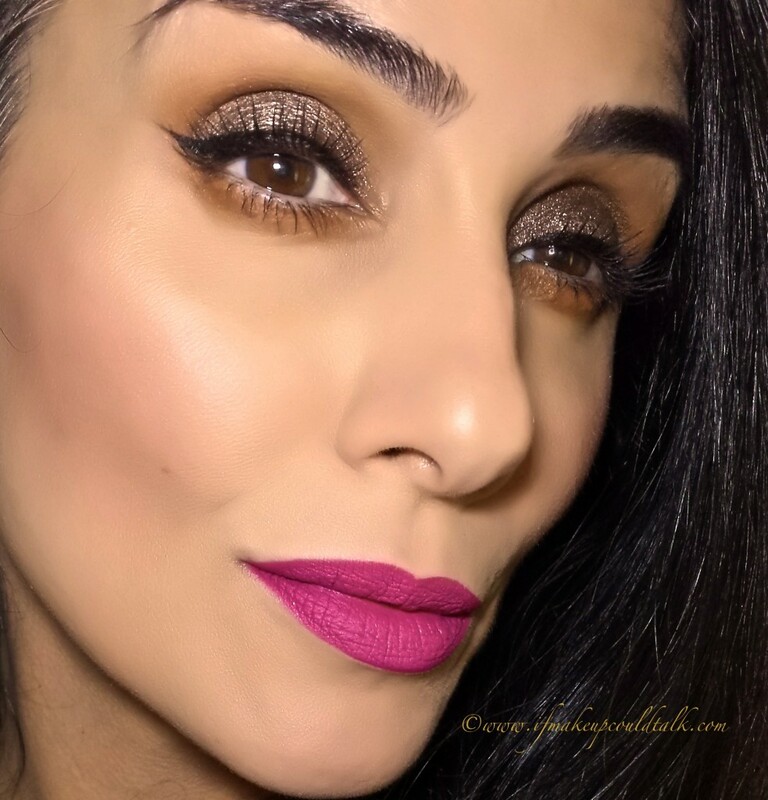 I simply use my ring finger to lightly press and sweep the powder around any area of the face I want to mattify and conceal pores or fine lines. 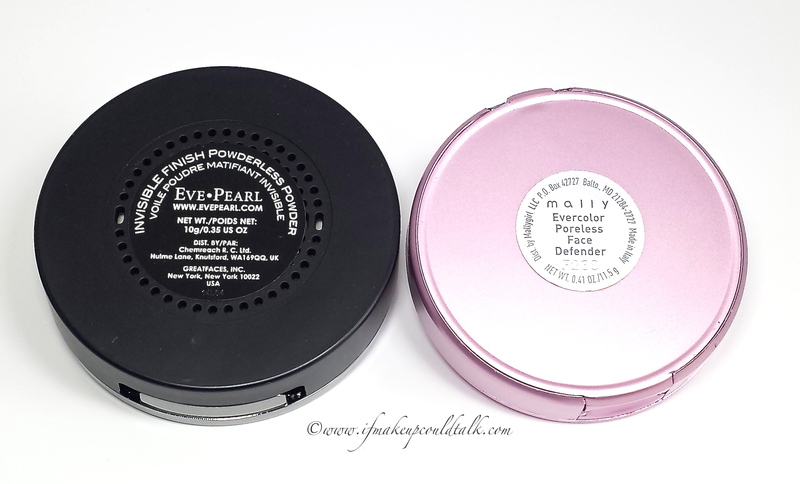 Eve Pearl Invisible Finish Powderless Powder vs. Mally Beauty Evercolor Poreless Face Defender. 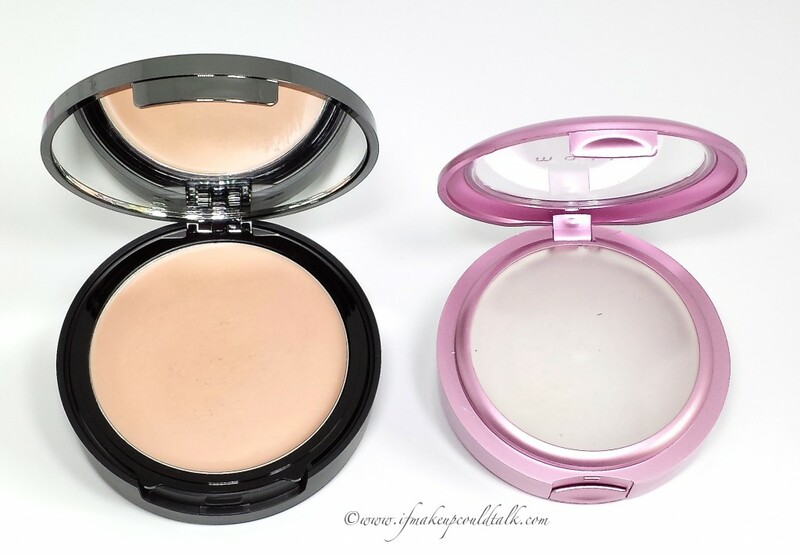 When compared to Mally Beauty Evercolor Poreless Face Defender, the clear differences lie in the packaging and the color/formula of the powder itself. Both products are intended to be used in the same fashion, but I find EP’s formula to be more moisturizing and easily applied with fingers. Mally’s formula is a bit drier in consistency (completely compose of silicone), which is ideally suited for sponge or brush application. 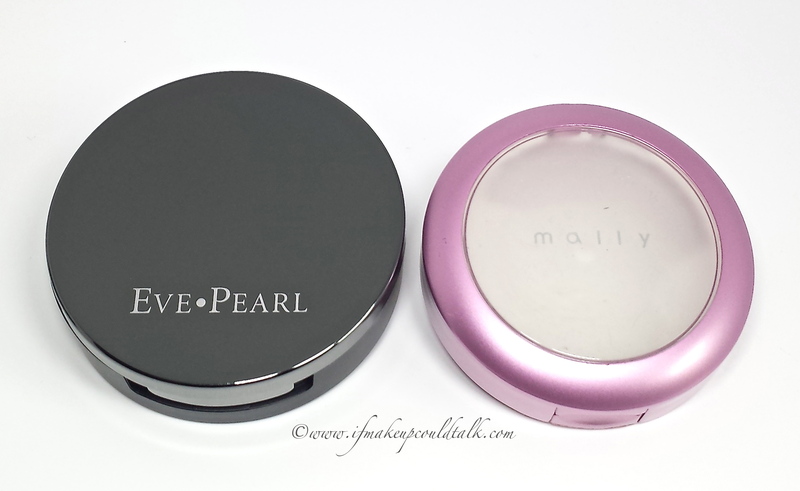 This particular Mally compact is the travel sized version and contains 11.5 grams of product. Her full sized version is a whooping 13 grams and comes housed in a bulky pink compact with an equally massive sponge. I was always hesitant to review this product because of the faulty packaging. After being in my company for two months, the mirrored bottom half of Face Defender inexplicably broke off. In addition, the oddly placed mirror was in a constant state of haziness, due to the used sponge which sat on top. 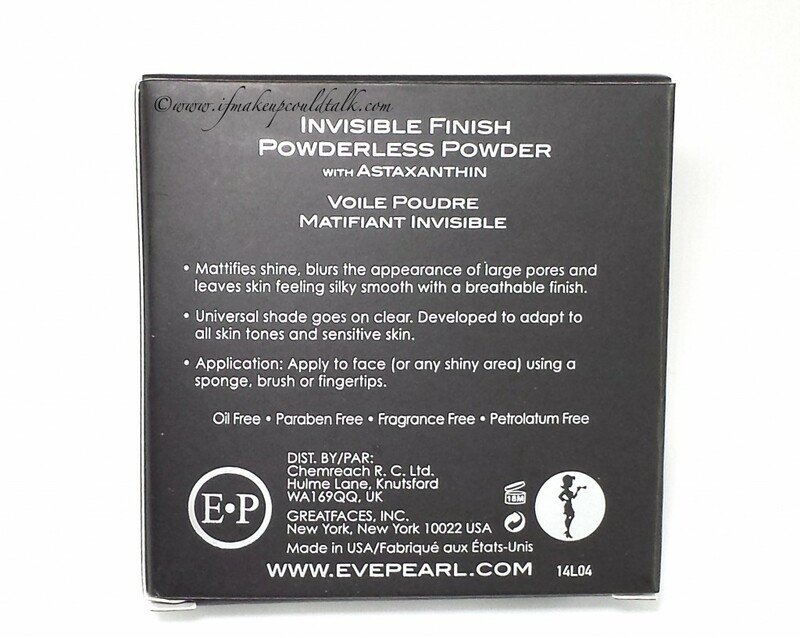 Full Face wearing Eve Pearl Invisible Finish Powderless Powder on the sides of the nose, frontal cheeks and forehead. When paired with Marc Jacobs Re(marc)able foundation, Eve Pearl Invisible Finish Powderless Powder truly gives a flawless look to skin. 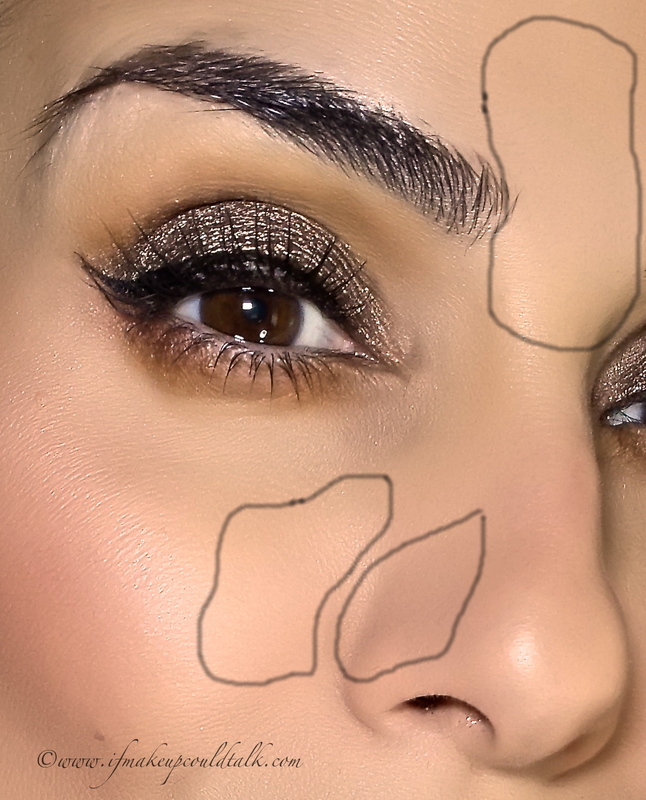 For the above photo, the powder was applied to the sides of my nose, frontal cheek area and between my eyebrows. 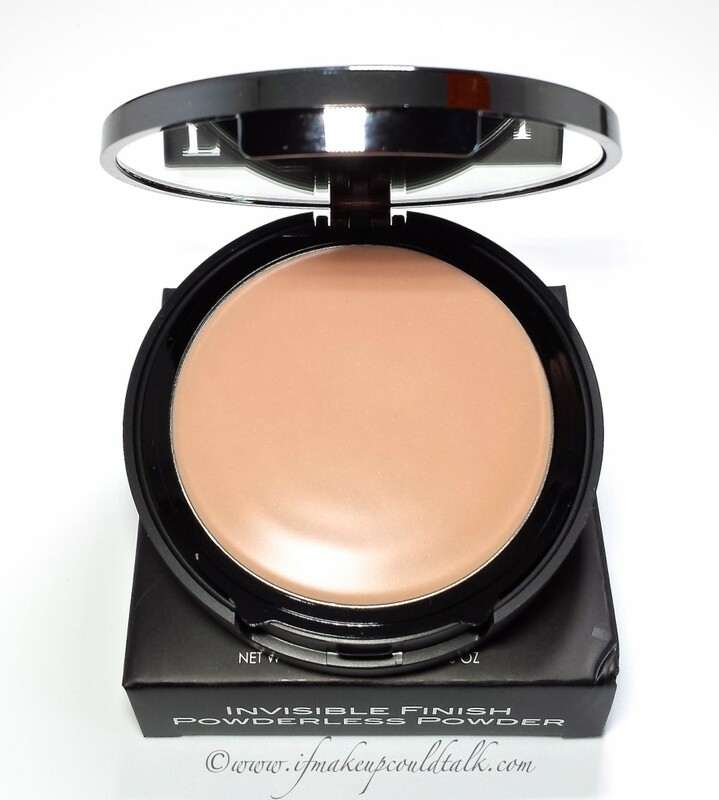 Makeup would tell you Eve Pearl Invisible Finish Powderless Powder is a definite home run. 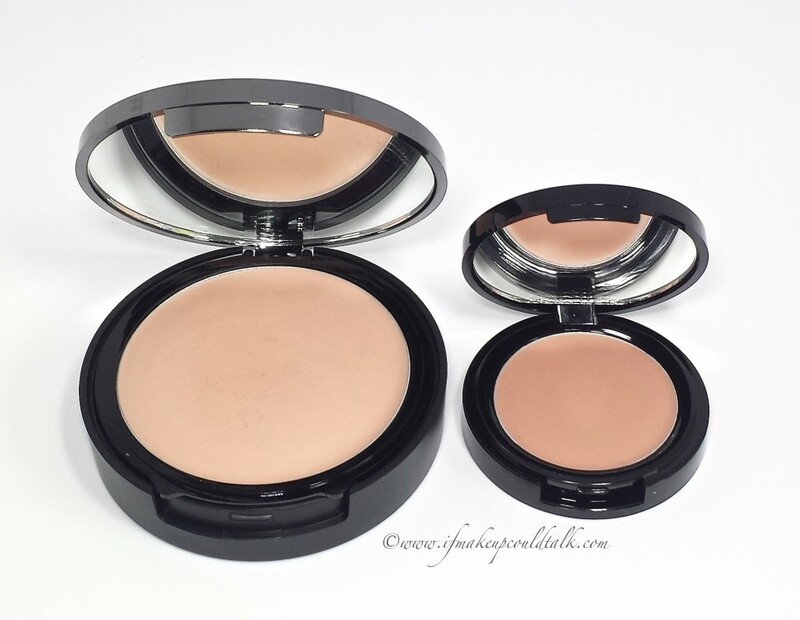 The cream-like feel, elegant packaging, diffused matte finish and impressive lasting power totally justifies the purchase of these two products. 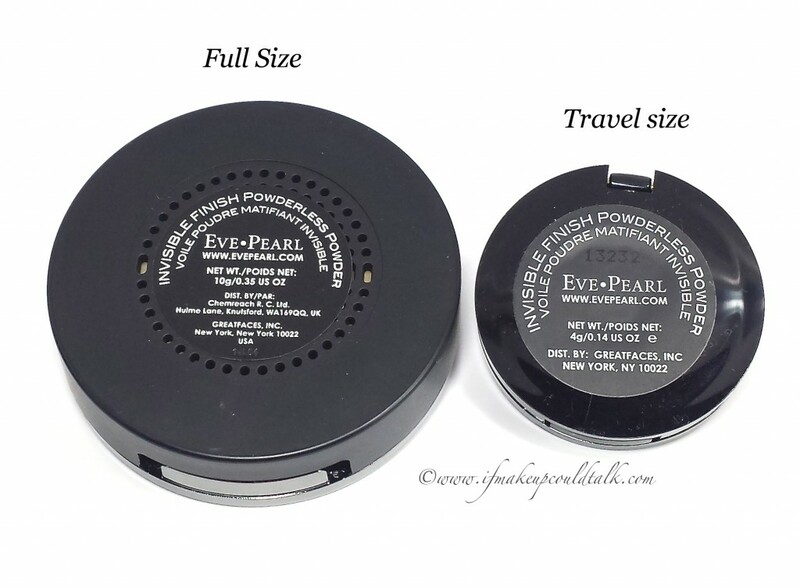 To make matters even more tempting, Eve Pearl hosts several Black Pearl sales throughout the year. All of her merchandise is grouped at a 40%, 50% and 60% off discount. At the time of my purchase the full size powder was 40% off ($30) and the travel size was 60% off ($16). Remember Black Friday is right around the corner, and I’m sure another Black Pearl sale is sure to follow. 🙂 Until next time, be well, stay safe and be happy. PS: The Eve Pearl finger palette in the featured photo will be reviewed next.